Flexure stages 7TF2 are ideal for high precision device manipulation. This stage suits almost any micro positioning applications range, for example, from fiber launch systems for single-mode, multimode and polarization maintaining fibers as well as waveguide alignment, through to the manipulation of microstructures in bioscience. 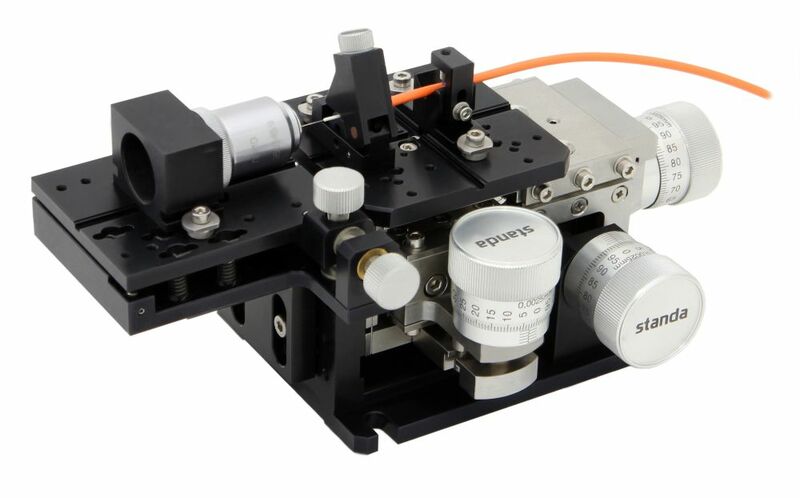 Fiber Coupling Stage of flexure compact block design with high-resolution micrometers ensures long-termed stability and good stiffness together with smooth motion without the severe limitations of sticking and friction. Fiber Coupling Flexure stages have a combination of overall size, travel, resolution, and low cost that makes them unique decision to meet the stringent requirements of photonics laboratory applications. Vacuum compatible Fiber Coupling Stages versions are delivered on request. Also as an option fiber coupling stage could be provided with differential screws. 7TF2 (right-handed or left-handed versions).